Clearly having seen better days, this budget priced Thunderbird still has some potential. Complete minus a convertible top of any sort, this Thunderbird would make for a great restoration project with its one year only paint color. Priced at $4,000, we think there is enough remaining to work with. Find it here on craigslist out of Lake Toxaway, North Carolina. Thanks to Chuck F for the submission! At a quick glance the body doesn’t look too shabby, but upon a closer inspection, the imperfections become more visible. The rockers have some bubbling, and mild rot forming. There is also some rot developing in the rear wheel arches. Most of the paint is present, but there are a few spots where the paint has failed, and rust has taken its place. The nose, or shall I say the beak, of this Bird has been nudged at some point needing some body work to be right again. 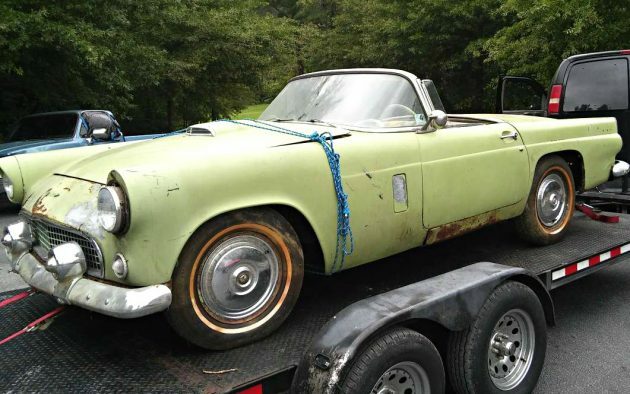 Rare in color, this Sage Green was offered only for 1956. 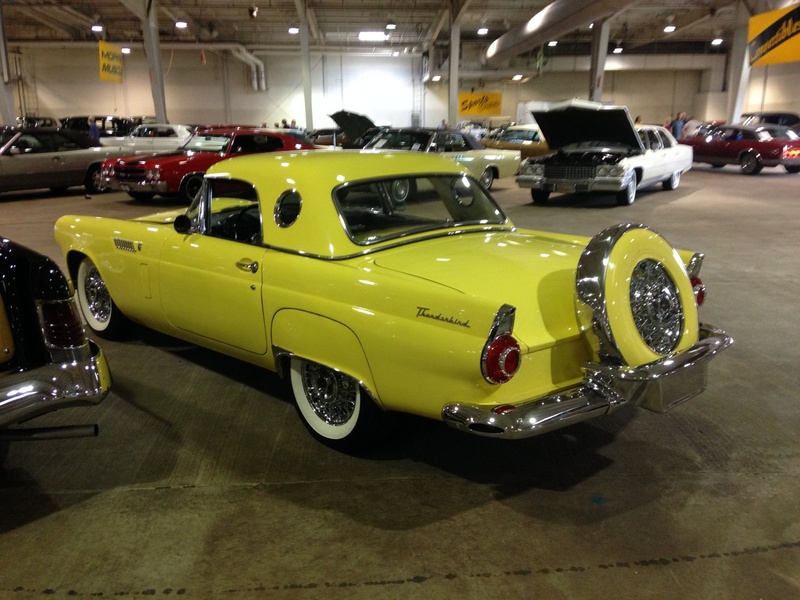 It is speculated that only 4% of Thunderbirds produced were in this color. Unfortunately there aren’t many photos of the interior, other than a nasty rot spot in the floor. That being said, there is an interior but it’s in mediocre to poor condition. The 312 V8 and automatic transmission are in unknown condition, but we are wondering what may be the future of this old bird. 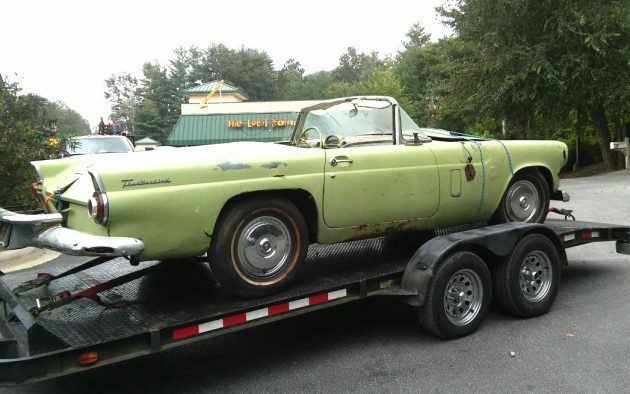 Certainly the most identified idea for this Thunderbird would be to restore it, or use it as a parts car. But there are plenty of creative folks out there that could make use of this old bird carcass. 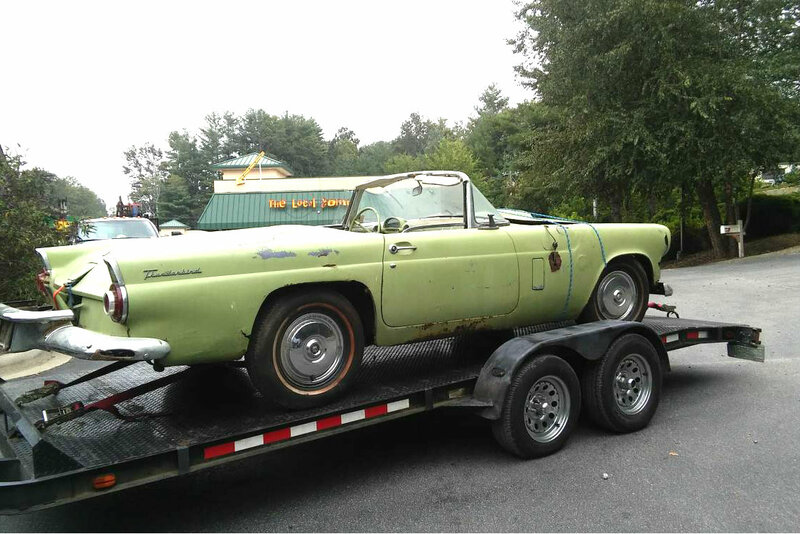 Wearing a rare color, and being mostly complete, would you save this Thunderbird? I really loved these early Birds when they came out, particularly the 57. 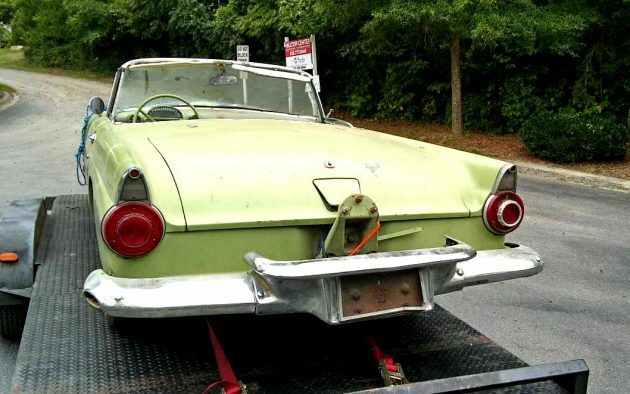 This 56 in an unusual color, with all of the options, could be a good restoration candidate. It’s clearly in need of a frame-off job, and the price is not bad as a starting point. The PA inspection sticker is a bit off-putting, given the liberal use of salt on roads in that state. I’m guessing that a fully restored #1 would be in the $50K range so I suspect that one would be under water on this one unless you did all of the work yourself. The rockers would be the most worrisome to me….getting it all aligned correctly. It would be interesting to see what the body looks like after a complete soda blasting. Personally, I was only a fan of the continental tires as a teen-ager making AMF and Revell models and lost that lust as I aged out. However, as an option, I’d guess it would add value. 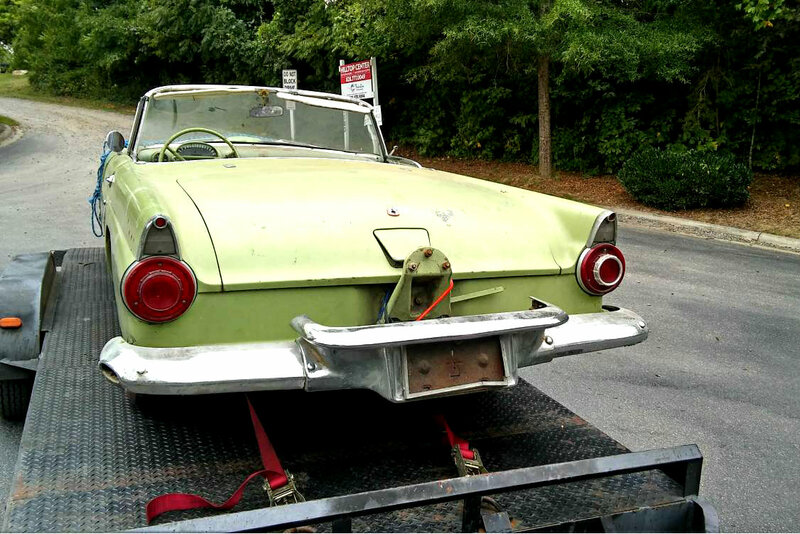 Here’s a 1956 from a 2014 auction in Raleigh to give a flavor for a finished #1 or #2. I agree the value of these ol’ birds may put this in the catagory of too far gone. What would be cool is some sort of DePaolo Battlebird tribute. Not full-on but a street-able track toy maybe. There maybe enough left to go a route like that. Below is a link to an original and goes into great depth on the mechanical mods plus has a nice gallery. ufda. that’s some serious rot in the floors. i wonder if someone had a go at restoration in the past and this would be the second time around? i really do like that color. if someone told me i would like a sage or seafoam green on a 56 tbird i would have called them crazy. with a white top, white interior and black carpet it would be a stunner. @redwagon: … and similar whitewalls! I would definitely save this one. One of the best cars ever produced in my humble opinion. 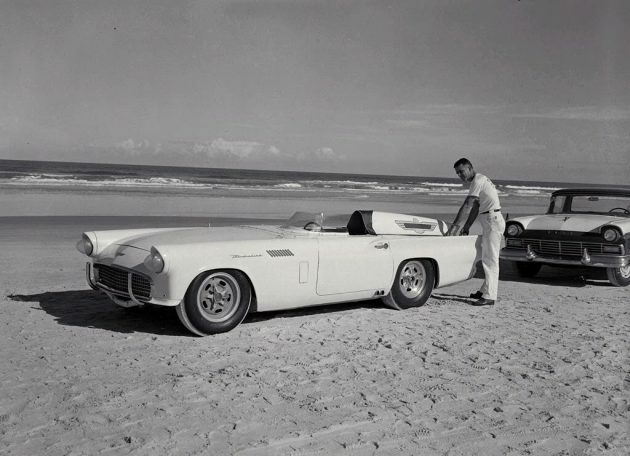 Convertible tops are readily available, and I believe even the hard tops are being reproduced. Perfect color too. 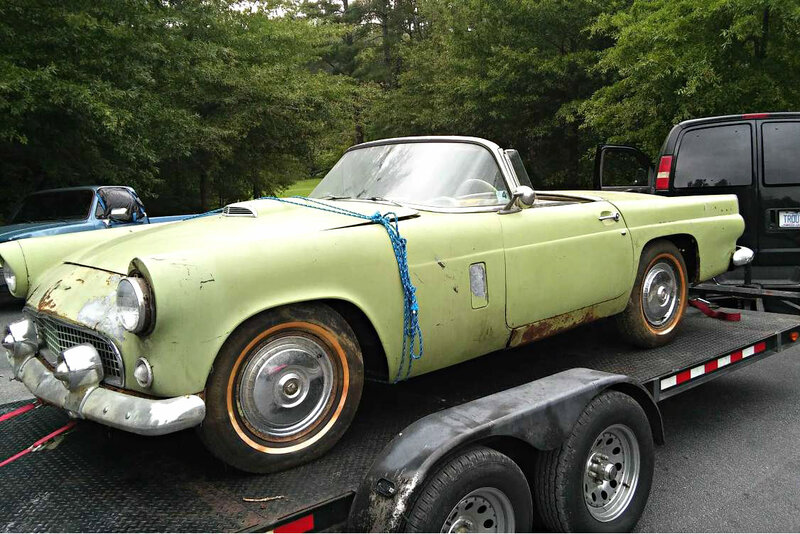 For a knock around bird….not a concurs or resto….this could be a good buy….and I have the missing head light ring ! I’ve always liked the 55-57 Birds, and they are so popular you can buy a replica kit, having the real deal would be cool. When I saw this ad the pictures weren’t posted, but I thought it was a good buy, now I see it looks like a flipper,at least he didn’t ask a crazy price, makes you wonder what he paid for it. I don’t think it will last long. Coming from England I’m embarrassed to say that I ‘m not sure what part of the car ‘Rockers’ refers to. Can someone let me know, please? Thanks in advance. Same as outer sills. I have no idea where the term rocker panels came from. If this is a barnfind,the barn didn’t have a roof.Looks to me like it was parked without any top,possibly without the hood in place,and used to store snow since 1970.What else would cause the trunk to be in such nice condition,but floor/kick panel rotted away,and that rust hole high on the right fender,I dunno? 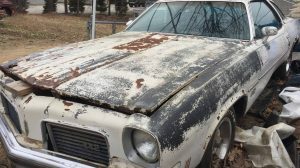 The seller should have included a few more pictures(engine compartment/seat),no matter what the condition,and I for one would be more of a player.What I see doesn’t scare me,but an engine/eng. compartment that’s been under water for fifty years does.Now if the eng./eng. cpmnt looked like the trunk,I’d be on the phone.Redwagon,I’m with you AFA restored,repaired,obviously a repainted body,but I’m from the Alfa Romeo(rust) world and I’ve seen worse saved. I don’t know enough about the early birds to tell when they’re too far gone just by looking at them,wish someone who does know will chime in with solid knowledge and help me out on this one,I’m on the hook.